As the summer heat rises one of the best ways to keep cool for humans and canines is a dip in the pool. But, what do you do if your four-legged friend isn’t keen on getting in the water or never mastered the finer arts of swimming? The answer is to get them a pool float. That way they can join in all the fun without getting their paws wet and you can be secure in the knowledge that they are safe while you are all having fun. But, with so many different shapes, sizes, and styles of pool floats to choose from, which do you get for your dog? Our panel of pet experts and dog lovers have put together a list of the best dog pool floats to get you started. 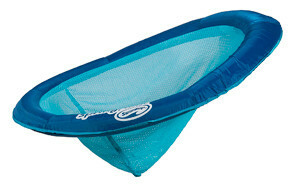 The Kelsyus Floating Hammock by SwimWays is designed for safe use in pools and lakes. Created for use by adult humans it is more than capable to supporting the weight of even larger dogs. The durable fabric cover reduces the risk of your dog puncturing it with their claws. Stability and additional comfort are provided by the patented inner spring that sits around the outer edge of the float. The main bed area is created from a mesh material that suspends the body just below the water’s surface, helping to maintain a cool and comfortable temperature. The SwimWays Spring Float Paddle Paws Dog Pool Float is custom designed for your pet pooch. The float is covered in claw friendly material that is puncture resistant and features a paw print pattern. 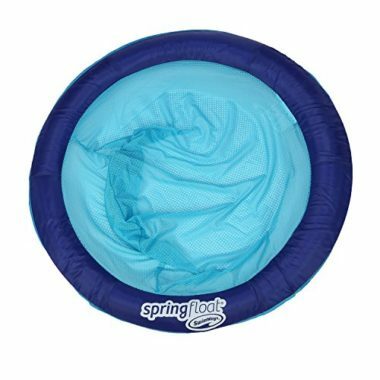 The inner spring of the float is sewn into the outer edges of the reinforced construction to provide greater stability and comfort for even the wiggliest dog. 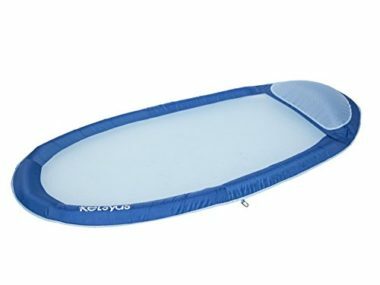 When your dog has finished the pool float deflates quickly and is easy to fold for storage and transportation. If you are looking for something fun, comfortable, and durable for your dog, then the PAWCY 6200 Doggy Lazy Raft could be just what you need. The paw print shaped raft is made from sun-resistant, durable vinyl fabric that is guaranteed to be puncture free when it comes to your dog’s claws. The raft is stable in the water with a small hole in the side of the raft that allows the layers to lay flat on the water. It is easy to inflate and deflate when your dog is finished with it. If you are looking for something a little different for your dog when they are relaxing on the water, then try the SwimWays Spring Float Papasan Pool Chair. The floating pool chair is covered in fabric for comfort and has an inner spring for additional water stability. The seating area is made from soft cooling mesh and allows your dog to be suspended just below the surface of the water to keep them cool and comfortable even in the warmest weather. The pool chair is easily folded for storage and transportation and can hold a human up to 250lbs, so is easily able to hold the weight of most adult dogs. 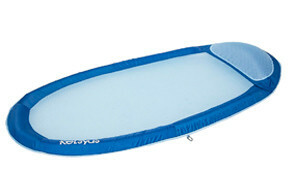 The KOOLTAIL Paw Dog Pool Float is designed specifically for dogs and comes in a fun paw print design. The top side of the float is covered in a thicker material to reduce the risk of punctures. Small holes in the float are designed to help the float’s layers lay flat on the water surface and increase its stability. It can be attached to a cord via a cord lock on the bottom for easy maneuvering or tying to the side of the pool. 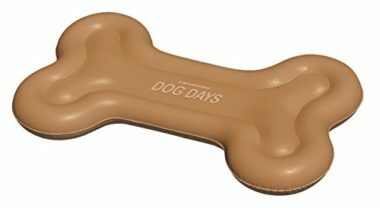 The Swimline Dog Days Bone Float is a fun and unique way for your dog to enjoy relaxing in the pool. Designed for human use, but just as easily used by your four-legged companion, the float is made from high quality materials and is large enough to accommodate medium to large dogs with ease. The float is a one-piece inflatable that can be squashed down and folded when not in use. As well as knowing what pool floats are available for your dog, it is important to think about what to look for in the best dog floats for pool or open water use. In this section of the guide we look at considerations for buying dog floaties, why having one is a good idea, and the different types that are available. 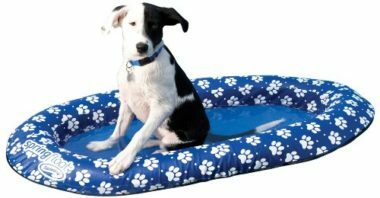 We also explore some of the most frequently asked questions about inflatable pool floats for dogs. What is the maximum weight the float can take? If you are unsure whether it is suitable for your dog, ensure you weigh them before purchasing the float. If you have a tall or long dog, then a round float may not be suitable and your dog may find it very uncomfortable if they need to stay in one position to maintain its stability. Similarly, a long float may be unsuitable for a very small dog if they want to curl up at one end. This will make it unstable and more likely to tip. While a pool float does not need to be made specifically for dogs to be suitable for their use, much depends on the materials it is made from. Your dog’s claws are the biggest problem here. If he material is not strong enough to be claw resistant, then simply stepping on the pool float could cause it to puncture. Look for multi-layer floats or ones that have thick material on the top surface. Not all pool floaties are suitable for use on open water. So, if you want to use your float with your dog on a lake or something similar, check the manufacturer guidelines before buying. Dogs are not known for staying still, particularly when they are excited, which they are likely to be in a pool with their human family. Check the stability of the float before you buy, especially if you have an excitable dog that hasn’t quite figured out the water yet. If you want to be able to secure the floatie, either to the side of the pool or to a dock if you are on a lake, then you need a secure tether point. Such points should be on the side or underside of the float and should not reduce the integrity of the float. If they are made from a separate piece, such as an additional plastic ring, then check how well this is secured to the main body of the float. Firstly, a dog float is a lot of fun for both your dog and your family. It allows them to be on the water with you, even if they are not strong swimmers or are getting tired of swimming. Pool floats are also a great way to introduce dogs that are nervous or scared of the water to a pool environment. They can be close to the water, feel it, and experience enjoyment without having to be immersed in the water. 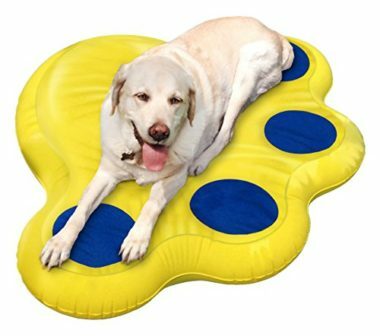 There are many different styles of pool floats that are suitable for dogs, however, all of them tend to fit into one of two main categories flat floats and chair floats. A flat float is self-explanatory. It is flat and floats on the top of the water. Chair floats have raised edges, so your dog sits in the middle and has a visible barrier between them and the water. Some chair floats have a mesh seating area, so while the edge of the flat is flat on the water, the seating area is slightly submerged once your dog is sat on it. These are a great way for your dog to keep cool, but they are not ideal for dogs who are unsure of getting wet. Some flat floats also have the mesh material in the central area giving them a cross-over look between a flat and a chair floatie. Q: What is a dog float for pool? 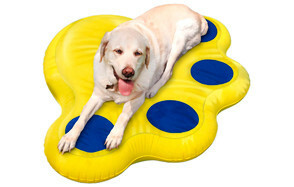 A: A dog float for a pool is an inflatable pool floatie that is suitable to take the weight of your dog. This allows your dog to enjoy being in the pool with you, while allowing them to take a break from swimming or treading water. 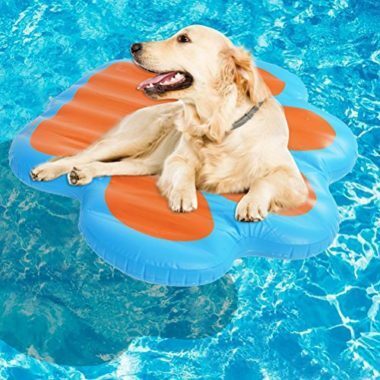 Usually such floaties are made from sturdier material than other pool floats so that your dog’s claws do not easily penetrate the material causing it to deflate. Q: Can the dog get into it from the water by him/her-self? A: That greatly depends on your dog and the float that you choose. Regardless, it is a good idea to hold the float still for your dog while they enter and, when possible, when they exit the pool float. You may need to support your dog while they climb in, just to give then a bit of a boost and reducing the risk of the float turning over. Q: How do I inflate dog floats for pool? A: Most can be inflated in the same way as a balloon, by blowing air into the innertube via a valve. Be careful not to over inflate the float and always read the manufacturer’s instructions before using the float for the first time. Q: Is it resistant to dog’s claws? 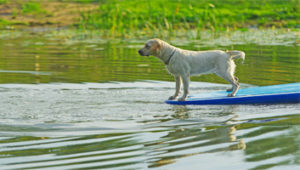 A: Floaties that are designed specifically for dogs are designed to be claw resistant. Those that are designed primarily for human use may not be quite as resistant. Check the materials that are used in their construction and look for those that are made from heavy duty vinyl and which state they are durable and hardwearing. It is a good idea to check your dog’s claws for sharp edges before they use the pool float and check the float for marks, weak points, and holes at the end of every swimming session. Our top pick for a pool float for your dog is the Kelsyus Floating Hammock by SwimWays. It is designed for safe use in pools and lakes. Created for use by adult humans it is more than capable to supporting the weight of even larger dogs. The durable fabric cover reduces the risk of your dog puncturing it with their claws. Stability and additional comfort are provided by the patented inner spring that sits around the outer edge of the float. The main bed area is created from a mesh material that suspends the body just below the water’s surface, helping to maintain a cool and comfortable temperature.